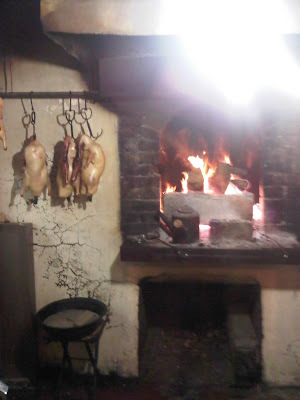 This is in the famous Peking duck restaurant "Liqun" in a Beijing hutong. Hutongs are very interesting, and showcase traditional living quarters in modern times. It is pretty amazing how even Western tourists manage to find their way through the maze to this restaurant where I am sure no one speaks any English. The ambience is just so authentic, and that also can mean quite grotty. So one needs to shut one's eyes to certain things, and more importantly, make sure that one's bio needs are taken care of before coming to the restaurant because the loos are outhouses located some distance away from the restaurant. I particularly like this photo which I think has captured the essence of the place, contrasting the delicious ducks with the humble surroundings, and the blaze of light creating an atmospheric quality.